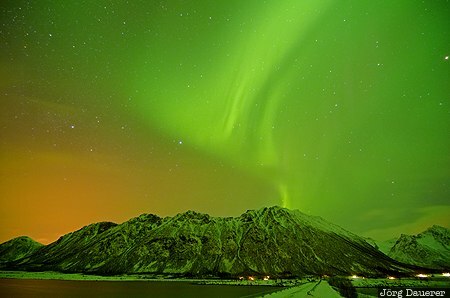 Aurora Borealis (also known as Polar Lights or Northern Lights) above the Norwegian Sea and the snow covered mountains of Austvågøy near Laukvik. Austvågøy is an island of the Lofoten archipelago north of the arctic circle in Nordland, Norway. This photo was taken in a clear cold night in March of 2013. This photo was taken with a digital camera.